The Imperial examination system of China goes back over two thousand years and its influence pervades Chinese cultural values to this day. In dynastic China the path to wealth and an easy life was through appointment to a well paid government post as a civil service official. The posts were open to any who could pass the daunting examinations. China was the first nation to appoint on merit rather than patronage. Education in China has for long been taken very seriously and Chinese children are known for their hard work and success at school work. This has its roots in the ancient examination system where academic success or failure held great importance. Even when a successful candidate was not given a job in administration, he would be held in great esteem by his community and would be consulted for advice on all sorts of matters. The chief difference to modern education is that examinations did not follow a rigorous age-related path up to culminate in a final University examination in their early twenties. Some candidates repeatedly presented themselves for examination throughout their lives. This was not considered odd or exceptional. The greatly admired Liang Hao of the Song dynasty eventually passed the exams at the age of 84 (as mentioned in the Three Character Classic). It was not uncommon for a grandfather, father and son all to take the same examination together. In 1889 there were 35 candidates over 80 years old and 18 over 90 years old - all from just the province of Anhui. If someone took the examinations throughout their adult lives but failed they were awarded the degree at the age of 80 and if a scholar survived to sixty years after graduation the Emperor would pay for a feast in his honor. Senior officials showed interest in the examination questions that had been set each year and acted as patrons and mentors for bright candidates who they were acquainted with. In this way study, among the scholarly, was a life-long passion and constant source of news and debate. The game of weiqi (or 'go' from its Japanese version) has been the pastime of Chinese people for over a thousand years. It is a strategy game where luck does not play a part. The skill often involves deceiving an opponent of true intentions. Counters are placed on a 19x19 board one by one until all 361 pieces are used. The winner is the player with the most 'living' pieces accounting for captures of the opponents. Only as late as March 2016 has a computer program been able to match a human master of the game. 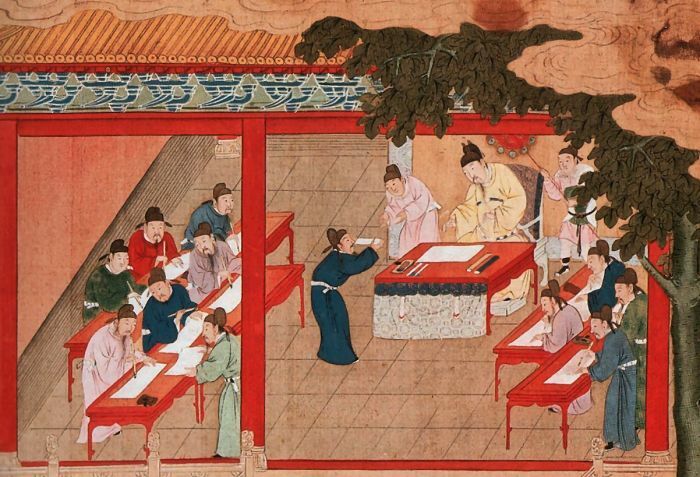 The origins of the open examination system (Kējǔ or 科举 in Chinese) are in the early Han dynasty when wise rulers figured out that the way to avoid officials building power bases from their family and friends was to appoint on basis of talent. Long before Confucius himself had set the pattern by taking on students (disciples) on the basis of intellectual merit and not on wealth or family ancestry. 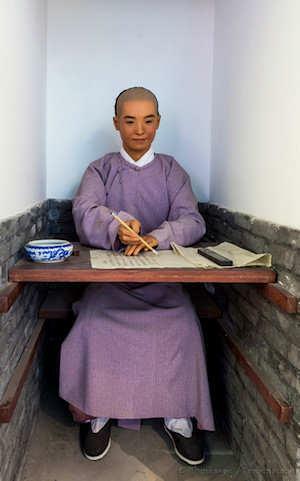 In 165BCE Emperor Wendi introduced a system of examinations testing the knowledge of the Five Confucian classics. The Grand Academy 太学 tài xué was founded in 124BCE. The Four Books and Five Classics (Book of Documents, Book of Songs, Book of Changes, Book of Rites and Book of Ceremonies) were the core texts. Candidates would also be set a question on current affairs. Later stress on agriculture and ethics were incorporated into the system and the Ming Jing (Expertise in Classics) grade was introduced. During the Sui, and Tang dynasties and again in the Song dynasty the examination system was strengthened and systematized. The system only really became a significant institution under the Tang, previously it had been used sporadically and only for few appointments. Its administration became one of the four principal directorates. By the end of the Song dynasty times as many as 400,000 candidates took the exams, but only about 1 in 300 passed; and only those who succeeded could expect a lucrative post in central government. Each province had to put forward at least three candidates for office each year. Written examinations were used to select Xiu Cai 秀才 (Flowering talent) scholars roughly equivalent to a bachelor's degree. Tang Emperor Taizong introduced the Ju Ren 举人 (Raised man) grade, roughly equivalent to a master's degree. The third level was the Jin Shi 进士 (Advanced Scholar) which is roughly equivalent to a doctorate. Those that passed the first, local Shenyuan ➚ ( 生员) exams automatically received minor privileges such as exemption from forced labor, effectively becoming middle class. Half of the candidates had no family history of passing the examination. The Emperor often took personal control of the examination system, reading the essays submitted for the highest levels. The top students at the top level were admitted to the prestigious Hanlin Academy. The academy was a pool of talent used for many Imperial purposes such as educating the Emperor's sons, drafting edicts and administering the whole examination system. To become a Hanlin academician was the pinnacle of academic achievement and brought with it great respect. The Examinations were so important that there are many allusions to them. 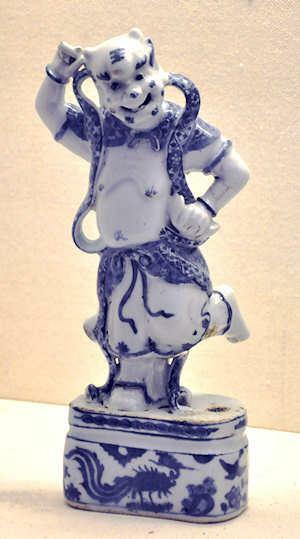 Gifts of porcelain and paintings would often have elements that wished the candidate luck. Apricots; cinnamon and crabs all have the hidden meaning of wishing good fortune. A colloquial term for the examinations was ‘Dragon Gate’ (龙门 lóngmén) and the tale of a fish (normally a carp) transformed into a dragon was an allegory for passing the examinations. The character for carp 鲤 lǐ sounds similar to 利 lì advantage. The location of this tale was on the Yellow River between Shanxi and Shaanxi. A euphemism for passing the examinations was 'breaking off a cinnamon (or cassia) branch 桂 guì in the moon' (as in the Western Chamber Romance ➚). On passing the examinations the scholar moves to the ‘Imperial Secretariat’, which was sometimes called the ‘phoenix pond’. Passing the exams was considered by Hong Mai ➚ as the greatest of the four Happinesses of Life. Kui Xing ➚ is the god of examinations, and offerings were made to him to help bring success. The system became more sophisticated during the reign of the first Ming dynasty Emperor Hongwu in 1382. Each prefecture (local district) had to have a school. Scholars who reached the Xiu Cai grade could then enter a provincial examination for the Ju Ren 举人 grade, held normally every three years. To pass this examination took years of study and it was rare for a candidate to be ready to take it before they reached the age of 30. The few that passed (5 to 10%) could then compete at national level at the capital city Beijing for the Jin Shi 进士 (Advanced Scholar) grade. To succeed at this level it was normal to have a patron who had been impressed by their scholarship and would then help with the candidate's studies and finances. Often a promising young boy would be supported by a syndicate of extended family and friends who would pay for materials, tutors and books. The successful official would then pay back his supporters and patrons with money, appointments and other benefits. A student would normally study in one of the many Academies ➚ (书院 shū yuàn) to prepare for the examination. If the Jin Shi examinations were passed the lucky candidate would be offered a permanent and lucrative post in government. During the Ming dynasty only about 200 candidates passed at this level each year; so there were only about 3,000 top scholars at any one time in the whole of China. A typical examination involved being locked inside the examination hall for several days and nights so candidates could not cheat, the essay they produced was marked on strict criteria. 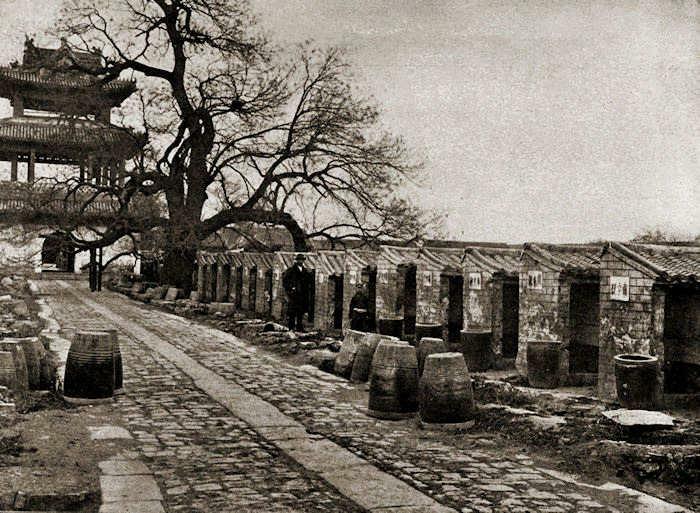 It is said that at a Nanjing examination hall there were 35 deaths of candidates each day during their incarceration - a candidate could not leave if they felt ill. Exact recall of the great Chinese classics (particularly of Confucius) was a key skill. The core works comprised about 400,000 characters so this was no mean feat, the whole Christian Bible is about 800,000 words. Memory rather than imagination was crucial to success. 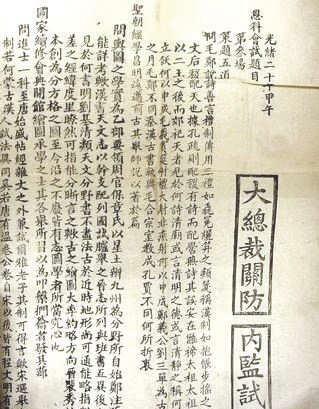 The eight legged essay ➚ (八股文 bā gǔ wén) was the famous test in Ming dynasty times, the answer was to be in 8 sections and could be no more than 700 characters in length. It should be remembered that old practices remained for a long period in Europe too; up until the 1960s it was necessary for candidates for British Oxford and Cambridge Universities to study the Classics in Latin and ancient Greek. It was only as late as 1855 that competitive written examinations were introduced for entry into the British civil service. In China although accomplishments in the literary Classics achieved the highest prestige, examinations in law; economics; history and science were also available. As there was no age limit, candidates could retake the examinations many times if they failed. So the temptation for those who just failed to reach the grade was to try again and again. A well attested case is of a candidate continuing to take the examinations until he passed at the age of 72. In the Qing dynasty about 2,000 men took the test in each prefecture, only 1-10% passed to reach Xiu Cai grade. Passing this far was no guarantee of furtherance if no posts happened to be available that year. The famous Tang poet Du Fu failed the examinations while fellow poets Wang Wei and Su Shi achieved the Jinshi grade and entered the Hanlin Academy. The novelist Cao Xueqin also failed; but more importantly the rebel leader Hong Xiuquan failed the exams and he went on to lead the massive Taiping Rebellion. Eight 八 bā is considered the luckiest number. You will often see 888 associated with gambling. The origin may be that 8 is a yin number and also sounds a bit like 福 fú 'good fortune' in Cantonese. Although it was ostensibly an open system, all candidates needed to be able to study copies of the classic texts and gain the advice and support of someone who had been through the system. So success often stayed in 'scholarly' families as the help of fathers and grandfathers was a great advantage. Only men succeeded, some women did try by dressing up as men, but none went undetected, only briefly during Empress Wu Zetian's reign were women allowed to enter for the examinations. In addition slaves, sons of merchants and actors were not allowed to take the exams. An important rule was that a candidate had to prove their name and ancestry by showing the family's ancestral tablet, if an ancestor had committed a disgrace, his name would not be on a tablet and so his descendents were barred from taking the examination. Examinations were however open to candidates from all parts of China, there was no bias towards Beijing locals, Jiangsu and Zhejiang were noted for providing good candidates. The examination system was not the only route to a lucrative government post, patronage still recruited a fair proportion of officials. Over the two thousand years various reforms were instigated to try to keep the system as fair as possible. Papers were copied before marking so examiners could not identify a student by their calligraphy. This could be sidestepped by the candidate writing phrases at previously agreed points so the (corrupt) marker could still recognize the candidate. Candidates were known to bring in various cheat sheets on fans; clothing and written on their skin. In more extreme cheating, some candidates paid for scholars to sit the exam in their stead. The decline of the traditional examination and education system came towards the end of the Qing dynasty. Western missions had started to found schools and universities which taught 'modern' science and technology. Corruption had become extremely widespread with bribes used to directly buy the qualifications. The system ended in 1905 to be replaced with a National University Entrance Examination (Gao kao 高考 ➚). It has a wider range of subjects including science and technology in the standard three levels of schooling: primary, secondary and tertiary. The gaokao ➚ is sometimes criticized as still requiring too much learning by heart and continues to evolve. In the period 1949-89 Marxist indoctrination formed a core part. During this era practical application was a compulsory subject so students would do some manual work as a part of the degree. Anyone who has worked with Chinese students will realize that the cultural and historical emphasis on examinations continues to produce hard working and receptive candidates. The continuing importance of educational attainment is based on a 2,000 year old respect for the profound importance of learning. Beijing's Examination Hall 贡院 gòngyuàn stood near the ‘Gate of Nation Building’ : Jianguo Men 建国门 at the eastern end of modern Chang'an Jie 长安街. It was built by Emperor Yongle on the site of the Yuan dynasty Ministry of Rites. The Examinations came to an end 1905 and the halls were demolished in 1913. Examinations were held here every three years in the third month. The 'hall' was made up of thousands of individual rooms or cells (see photograph). A candidate on arrival was given new clothes (to make cheating more difficult) and assigned a unique Chinese character identifying both his individual cell and his script of submitted answers. Once inside, the door was sealed and not opened for three days and two nights even if the candidate fell ill or died. If a candidate was successful he could buy a boat trip back home from the travel agents on nearby Carp Street 鲤鱼胡同 lǐyúhútòng; 'carp' was often used to symbolize wishing success in examinations. Citation information for this page : Chinasage, 'The Chinese Imperial Examination system', last updated 30 Nov 2016, Web, http://www.chinasage.info/examinations.htm.